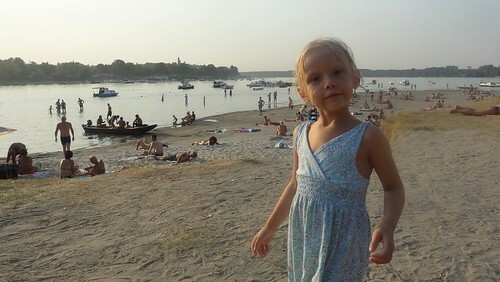 Last night after work, my daughter Ocean and I went to the Lido Beach on Great War Island. The island is in the middle of the Sava River, just upstream from Ada Ciganlija, near the Belgrade suburb of Zemun. During the summer months, the Serbian army erects a portable, pontoon bridge so people can cross and swim on the beach on the north tip of the island. During the other months, the small island is a Serbian military base and nature reserve for birds. It is called, Veliki Ratno Ostrva (Great War Island) because it was a strategic military point for the conquest or defense of Belgrade. It is very shallow and no white sand, turquoise water of the Adriatic, but it does have a cool vibe and with temperatures over 100F, it was just as good as any Caribbean beach. After a busy day at school with multiple meetings and the suffocating heat wave w are experiencing, it was nice to go to the beach, cool off, and just hang out with Ocean. She didn’t like the shells and rocky bits, but after awhile, got used to it. We bought some popcorn and then headed home. It was a brief respite from the busy school and family life I have.